Jungle Red Writers: Are you gonna eat that? Growing up Italian, I also knew that somewhere people were enjoying goat's head soup, but happily not in my home. Hands down the strangest foods I've ever encountered in my travels were those served up by the street vendors in Beijing. Their wares started life as things I usually ran away from - scorpions and cicadas, just to name a few. (They also sold fried tarantulas and chocolate-covered locusts if memory serves.) I had the full support of my husband who shivered when we passed the testicle vendor. Last week in Nepal, I passed on the yak steak. I realize they're almost cows but after all of my close encounters with them I couldn't bring myself to dig in. I'd keep hearing those yak bells with every bite. I did sample the nak cheese (female yaks are called naks) and it was pretty good, but that was as adventurous as I got. This is not a picture of me, but it could be. 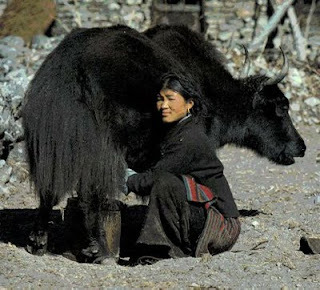 I didn't realize just how brave you had to be to milk a yak. I guess foie gras and caviar are pretty weird, but I don't indulge in them much anymore. Sweetbreads? Ick. Who came up with that name? Any adventurous eaters here? (I'm betting Rhys is an adventurous eater!) What's the weirdest thing you've ever eaten? I'm game to try just about anything. I do draw the line at insects. 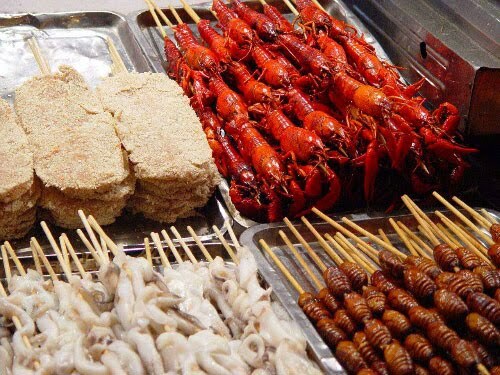 In China we passed on the barbecued scorpions. And most innards aren't my thing. I love eel. Squid, yum. In Australia delicious Morton Bay Bugs - a sort of crab/lobster/shellfish thing. 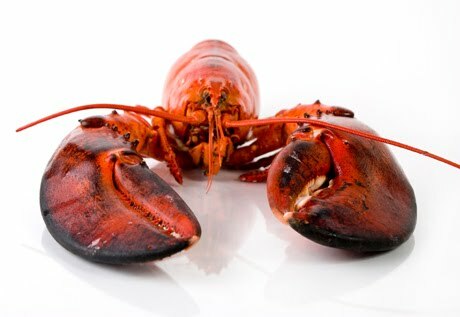 Ro, if lobsters creep you out, MB Bugs would send you over the edge. I was so proud of one of my daughters when she was about 6 and we went to the ice cream store and she announced she wanted a scoop of pistachio ice cram. Why that flavor I asked. Because it's green an I've never tasted it before. That's my girl! It's hard enough to think about (delicious) rack of lamb. I'm with Rhys (as always) one cannot think about relationships with food-to-be. I could never never eat an insect. Sorry. Jonathan and I will never win the Amazing Race. RO, don't you think you and Bruce should do that? It's a toss-up between haggis and congee. In both cases I had to swallow, smile, and pretend I liked what I was eating. I had to look up congee. I've been given rice pudding for breakfast but don't know if it was congee. Nak...yes! good scrabble word. Here's another - zopkio. It's a yak/cow hybrid. Darlene... I like both haggis (ate it in Scotland) and congee (in China - all the things you mix into it are delicious), though I wouldn't want a steady diet of either. What has always made me curious, though, are eggs. Who on earth saw one coming out of the backside of a chicken and said "Mm, that would be good to eat" ?? ?